We had high winds and driving rain overnight, as several thunderstorms passed through. 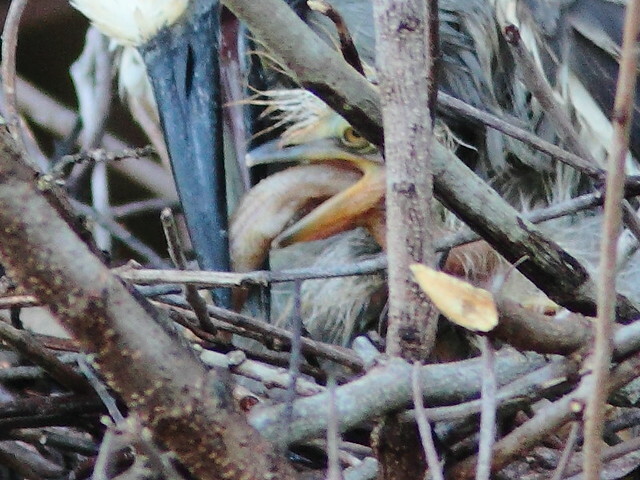 I was concerned about the safety of the herons nesting in the rookery near our South Florida home, particularly in the trees defoliated by herbicide treatments that exposed their nests to the elements. To keep track of the nests we have given them numbers, based upon their location relative to the row of ornamental Live Oaks planted on the bank of the canal opposite the nests. 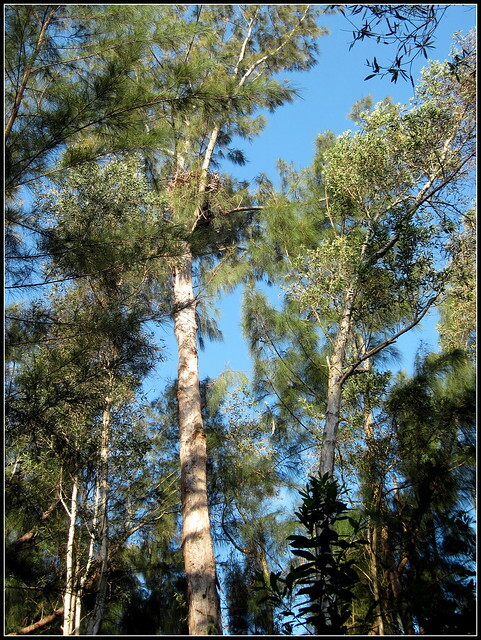 We also designate whether or not the nest trees have been treated by herbicides (HT or non-HT). 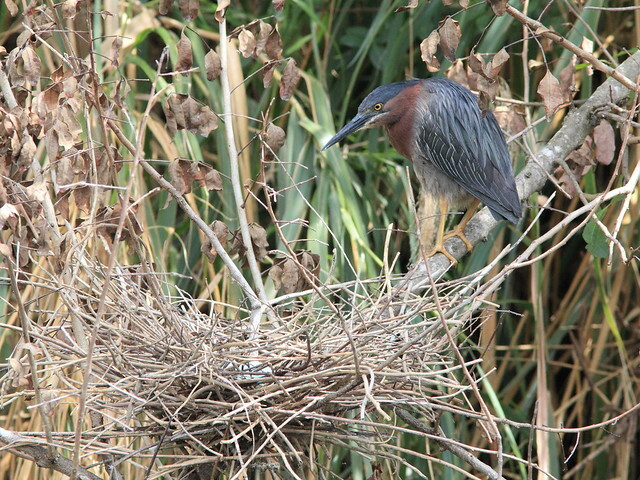 Nest #4 HT is occupied by the first pair of Green Herons, and the next 5 are those of Yellow-crowned Night-Herons. Nest 9 HT and 10 non-HT respectively have nestlings and eggs. Nest 9.5 non-HT is newly constructed and we have not yet seen any eggs. Nest 19 HT and 20 HT contain eggs. 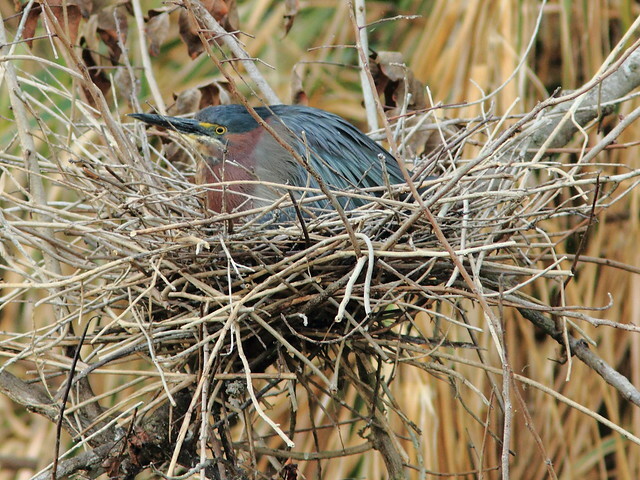 Nest 22.5 non-HT (we call it the culvert nest because it is opposite a culvert) belongs to Green Herons that now have eggs. The male of the pair that occupy the culvert nest was very likely the same one that became entangled in fishing line and was rescued by Steve Siegel (see earlier post). It spent 3 days in rehabilitation and rejoined his mate. This morning, in between thunderstorms, I checked on the welfare of the herons. All the nests were intact. 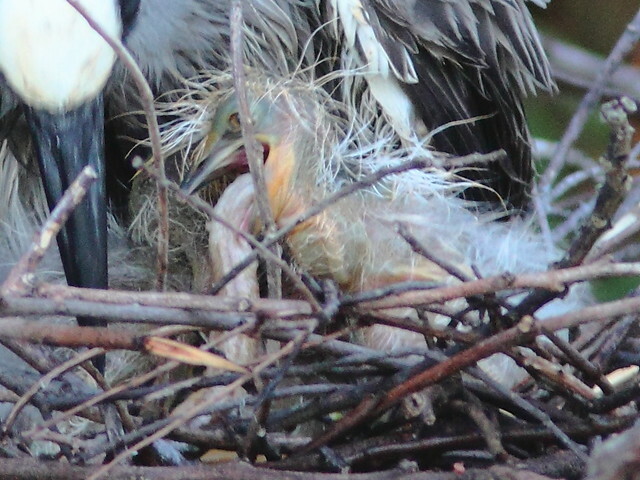 The chicks in the night-heron nest #9 HT were 2-4 days old. 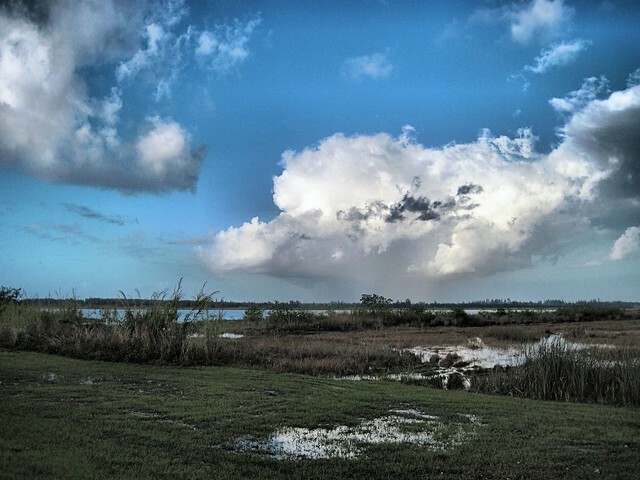 The next wave of storms was approaching from over the Everglades. 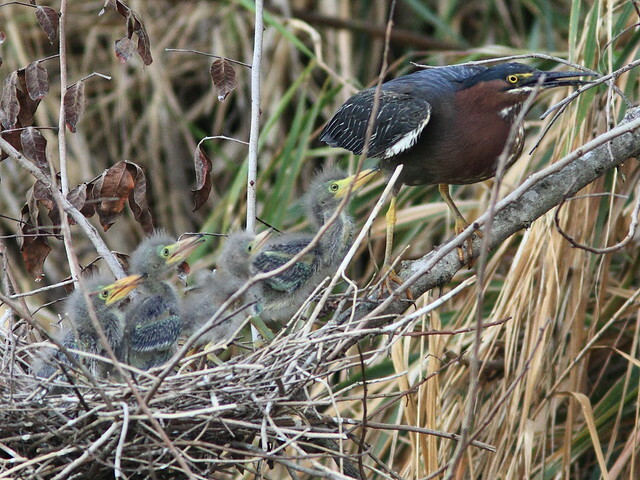 Green Herons have a 19-21 day incubation period. 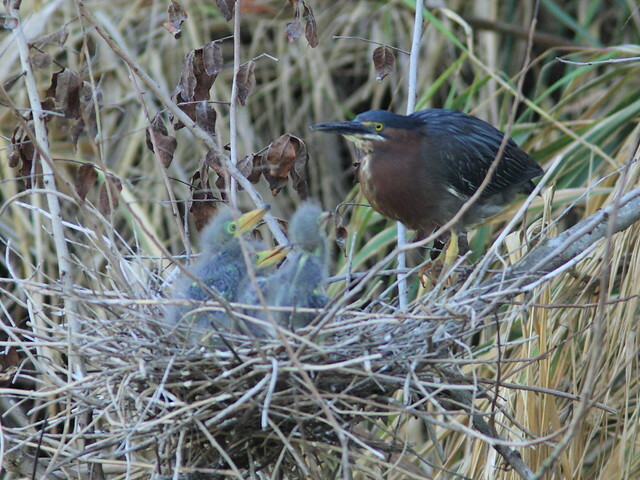 We first saw eggs in the Green Heron nest on March 25, when the pair exchanged incubation duties. This was probably within a few days of when they were laid, so we expected them to hatch around mid-April. 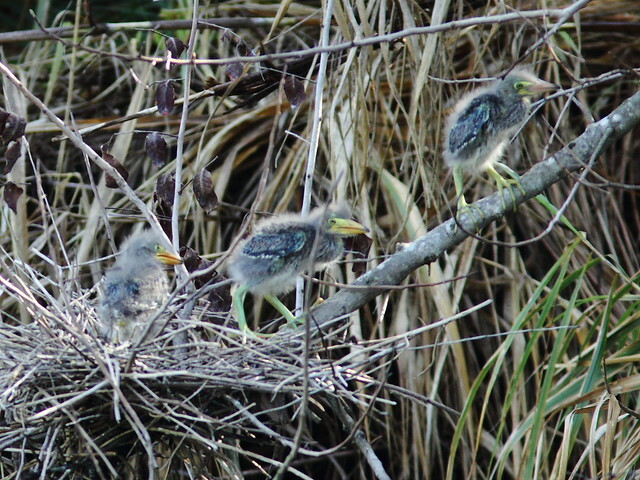 The young may leave the nest as early as 16 days of age, but are weak fliers and depend upon their parents until they are 30–35 days old. We again saw the blue eggs on March 27. 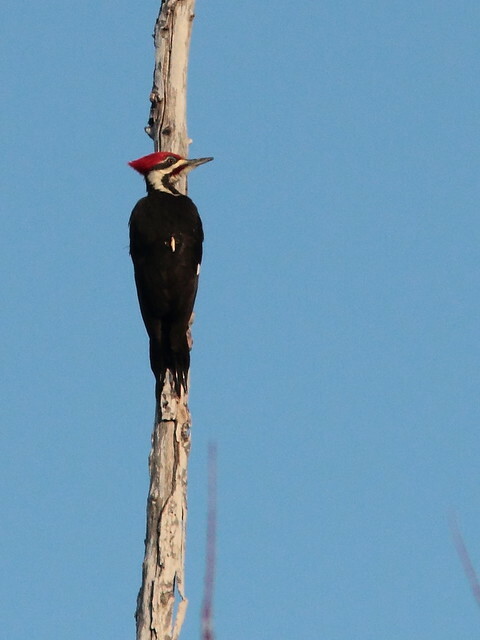 …and on April 10, when an adult was sitting very low on the nest. 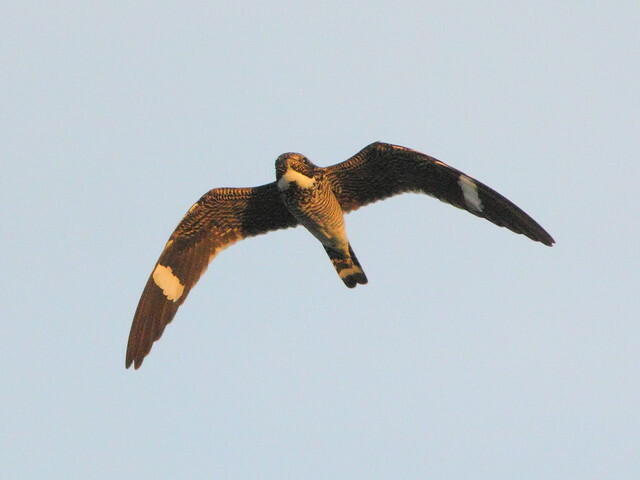 On April 13 the parent was possibly brooding one or more nestlings, as it was sitting higher on the nest. 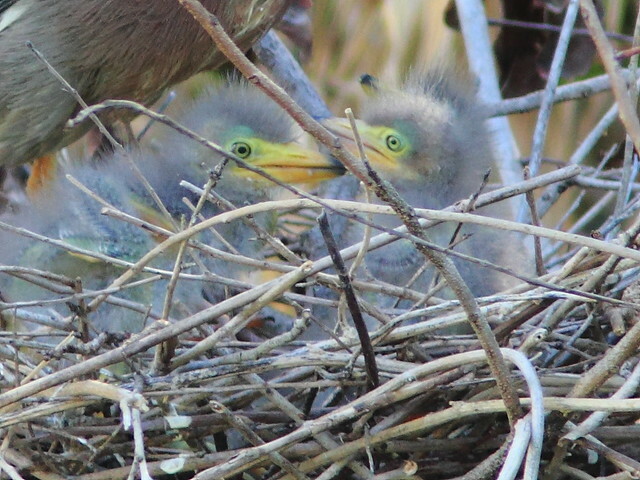 We got our first look at the nestlings on April 15. 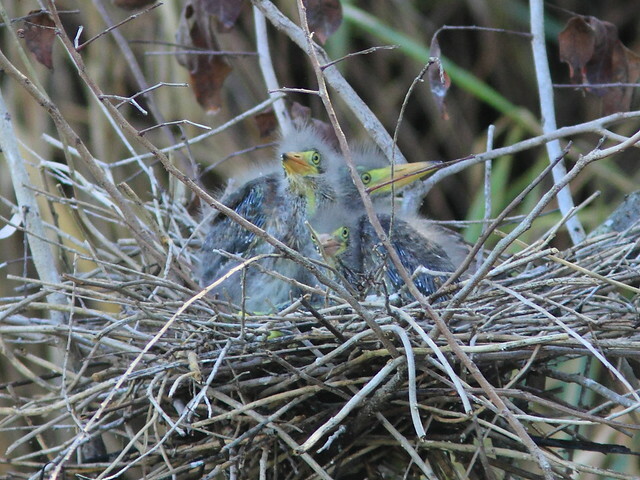 On April 18 we saw only three chicks. I made a video of the nest on April 19 (if not visible just below, click to view it here) and counted four nestlings. The smallest one must have hatched out a few days later than the others, as it was still downy. 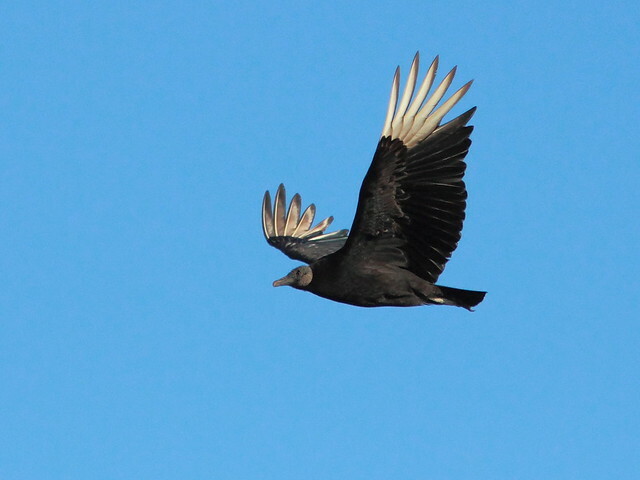 Note its soft gray coat and lack of pin feathers. This morning, the smallest of the chicks was missing, probably blown off the nest, which is very flimsy and sways even in a slight breeze. When I arrived they were alert and seemed to be waiting to be fed, looking in every direction for a parent. 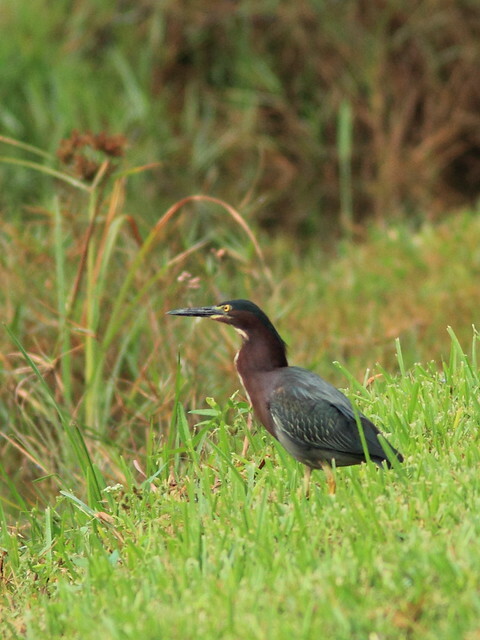 The Green Herons treated my neighbor Scott and me to a great show. I had watched them for about an hour as they waited to be fed. 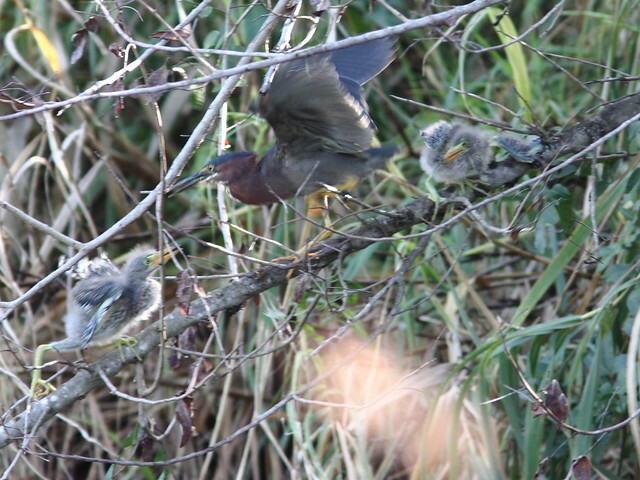 Only minutes after Scott joined me, the female parent flew in and quickly fed the chicks on the nest. She then walked to roost on a limb that led up and to the right of the nest. The chicks began to climb up towards her. 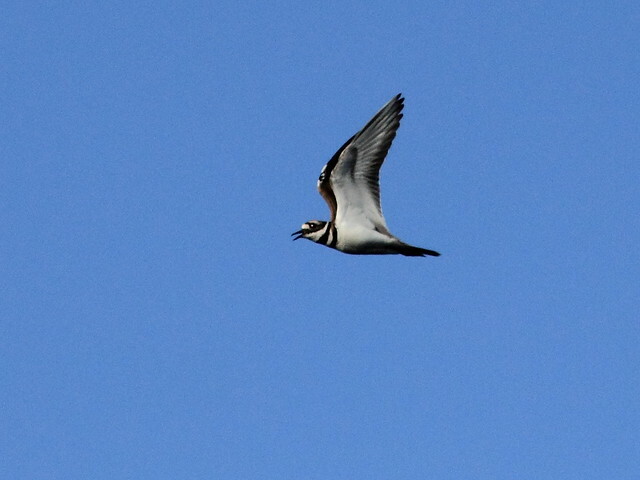 Suddenly the male flew in and landed nearer the nest. 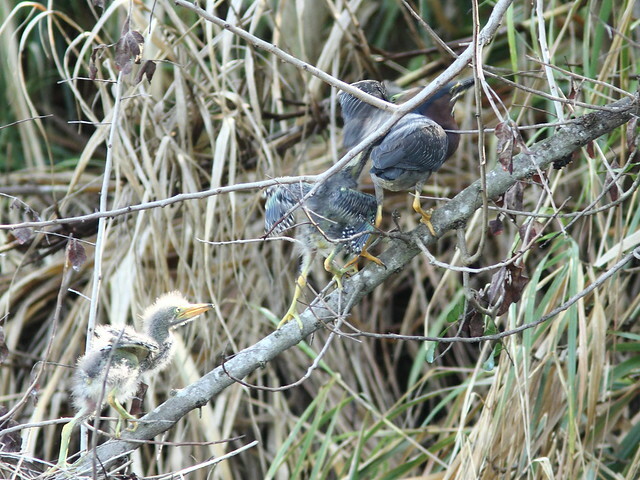 He was immediately mobbed, first by the largest of the three nestlings. 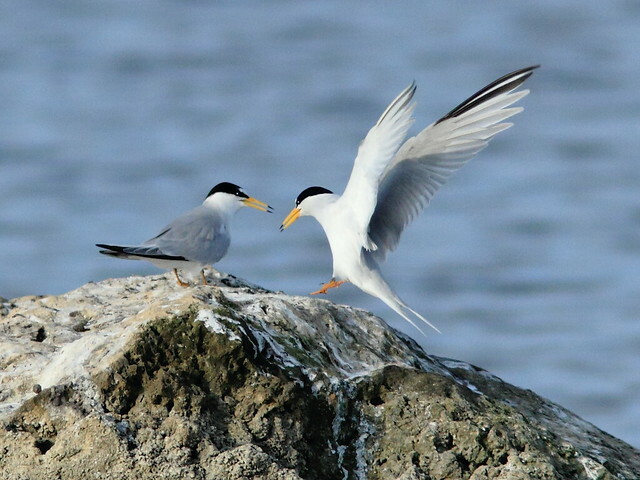 The largest chick fought violently with the adult, attempting to grasp his bill. They struggled so much that I expected the chick to fall off the branch into the water. 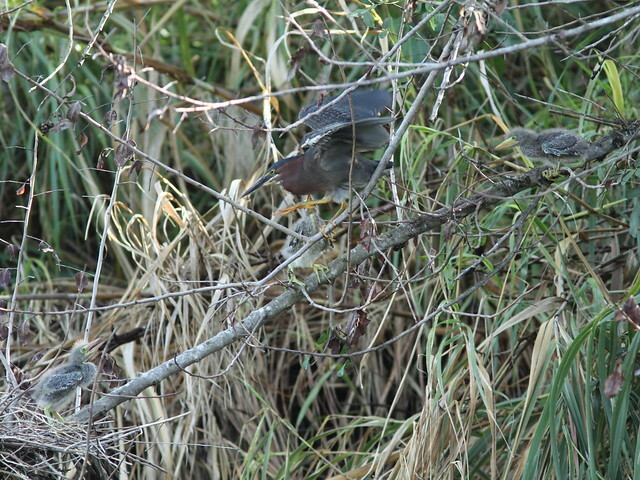 The parent was surrounded by hungry little herons. They flapped and tussled. The male herded the brood back into the nest, where he fed them in a more orderly manner. Here is the culvert nest with the female sitting on the eggs. 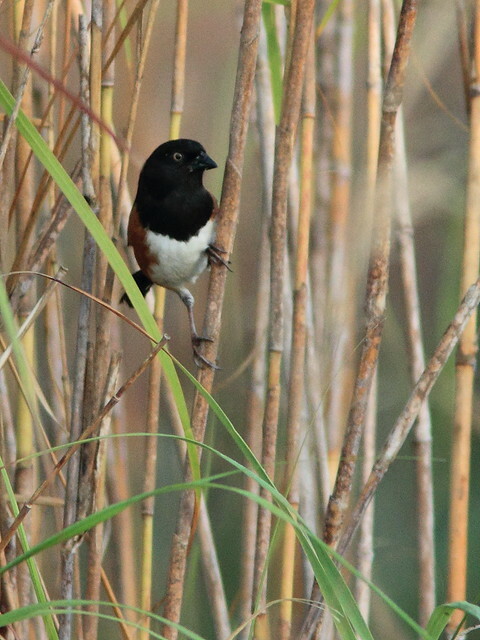 Successfully rehabilitated, the male parent foraged for insects in the grass just opposite the nest. 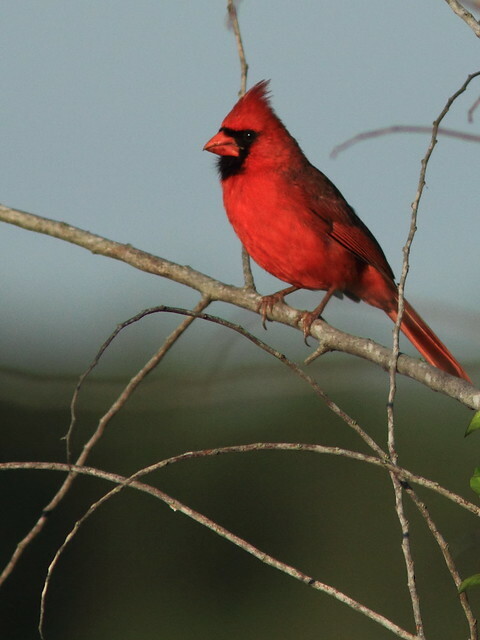 Our two Illinois granddaughters are visiting, and birding must take a back seat to grandfathering. We finally were able to get out the past three mornings while they are away visiting the theme parks in Orlando. This morning, pouring rain is allowing me some computer face time. As is our habit, we got out before sunrise. This is the view looking back east, towards the gate where we enter the gravel road that leads into the wetlands. 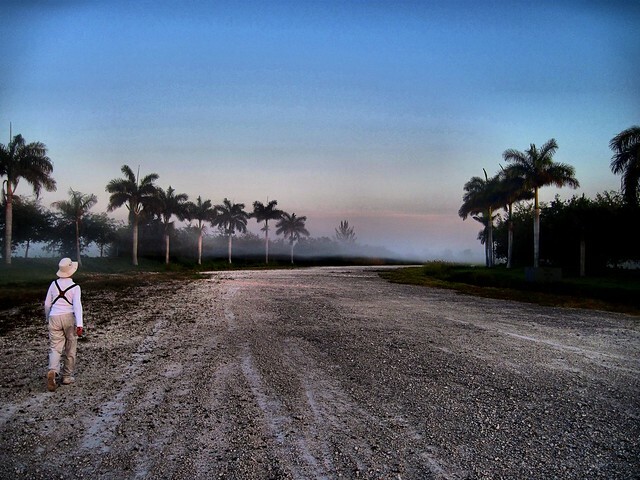 From the same spot, looking westward towards the Everglades, the ground fog is lifting, but sunlight has not yet reached the tops of the Royal Palms. Sad to think that this placid pathway will some day soon become the busiest parkway in our city. Actually, it will be the only road that traverses our entire city, running 22 miles from the Atlantic Ocean to Okeechobee Highway (US-27), which borders the Everglades preserve. 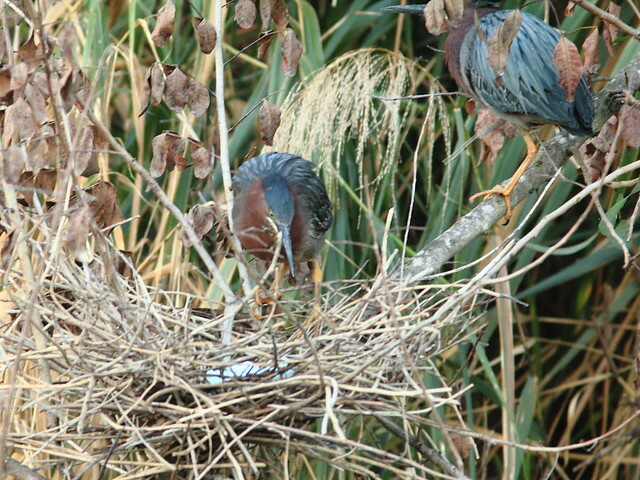 Welfare checks on the heron rookery have found them doing well, with eggs in five Yellow-crowned Night-Heron nests and one Green Heron nest. 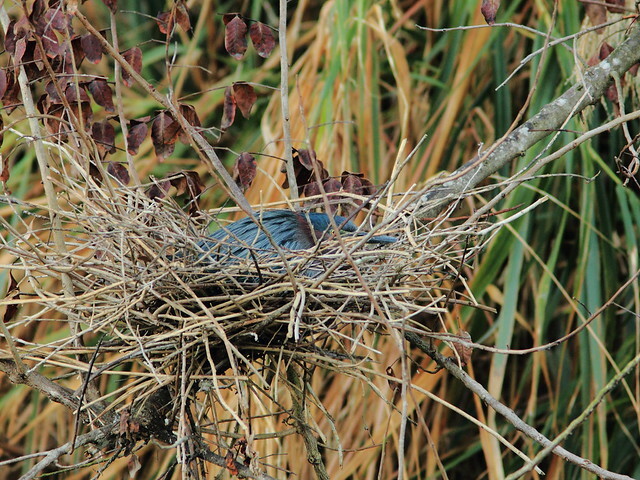 A sixth Yellow-crowned nest is difficult to see, but it appears to have been abandoned before any eggs were laid. 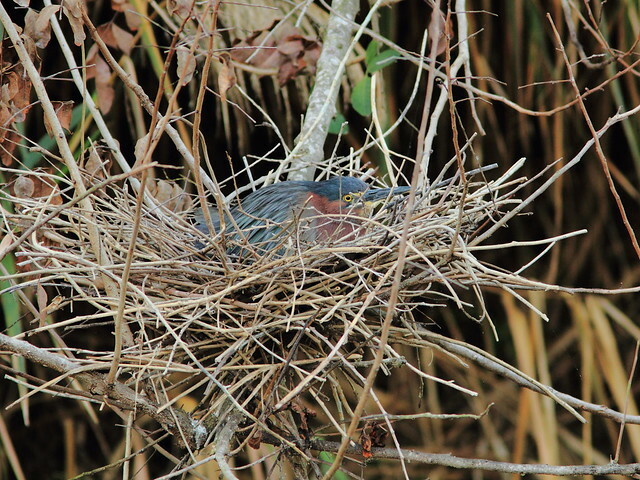 We suspect there is a second Green Heron nest but is is probably deep in dense vegetation. The Bald Eagle chick that disappeared from our local nest was probably not flight-ready. During the past three breeding seasons, we observed that the eaglets were usually seen branching or “helicoptering” for eight days prior to taking their first flight. This was never reported for this year’s single chick. Since we found no remains under the nest it probably had been carried off by one of the Raccoons, Bobcats or Gray Foxes that roam in the area. There was even an alligator trail that led to the base of the nest tree from an adjacent canal, also attracted by prey remains. 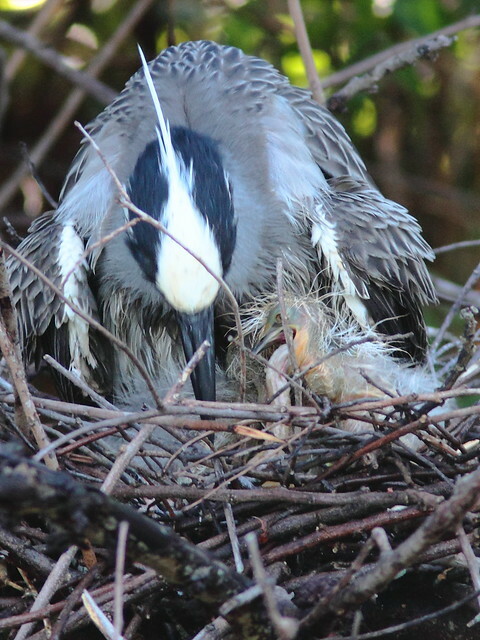 Follow events at the nest and see summaries of observations over the past nesting seasons at the Pembroke Pines Eagle Watch FORUM. 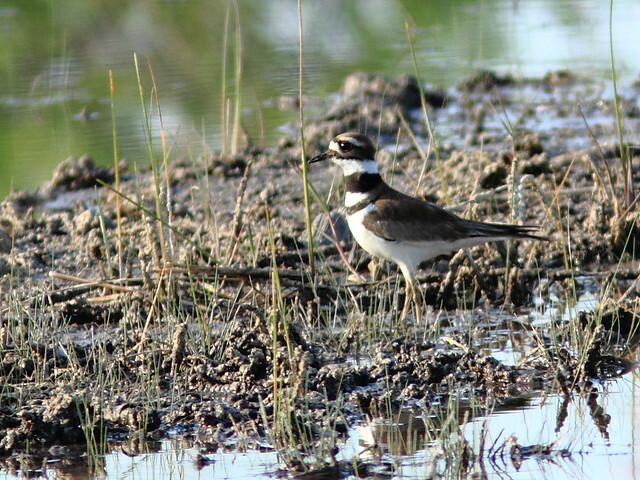 Since we had been walking our birding patch every morning until arrival of our guests, I’ve developed quite a backlog of photos and observations. 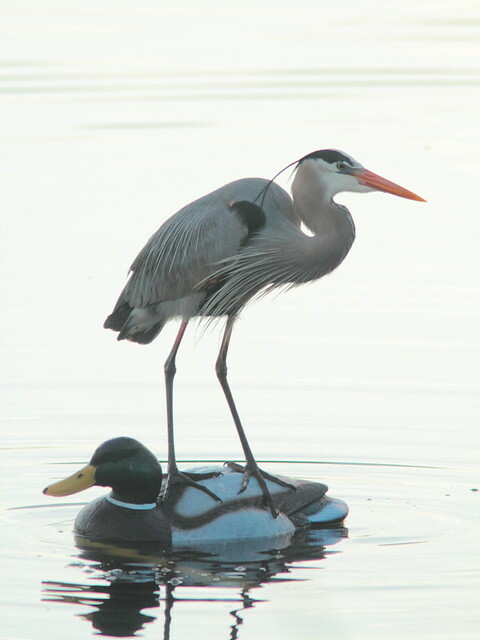 At risk of overwhelming readers with heron photos, I must share my first video, taken with a Canon 60D DSLR. Our Texas grandson, after showing me how to set up Skype, then coached me on the features of Windows Live Movie Maker. 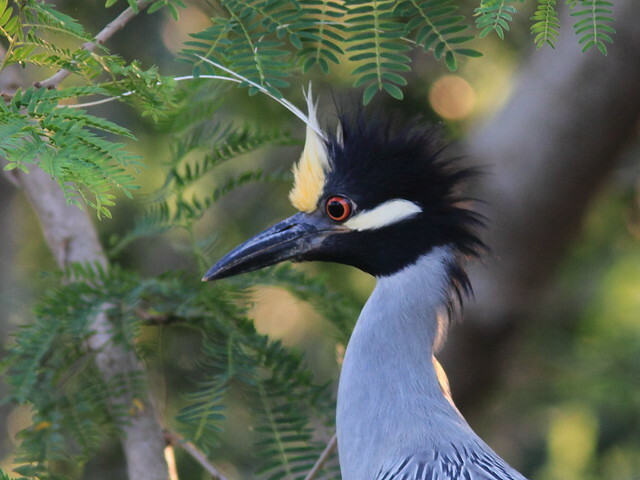 It is a short clip of a threat display by a male Yellow-crowned Night-Heron. 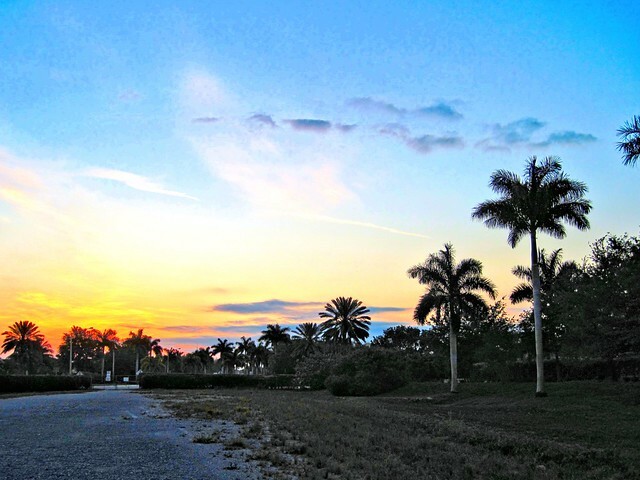 Palm and Yellow-rumped Warblers have disappeared. 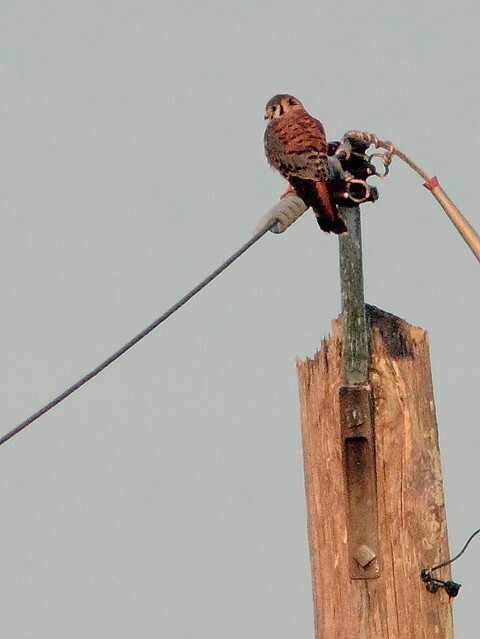 We saw our last American Kestrel in late March. 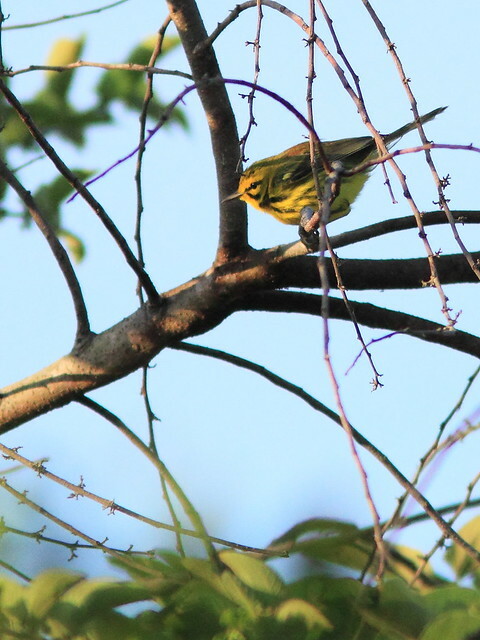 We have not yet seen the hoped-for influx of northbound warblers, tanagers, vireos and orioles. Small flocks of Prairie Warblers have passed through. Some will stay to breed locally. However, there are signs of spring. 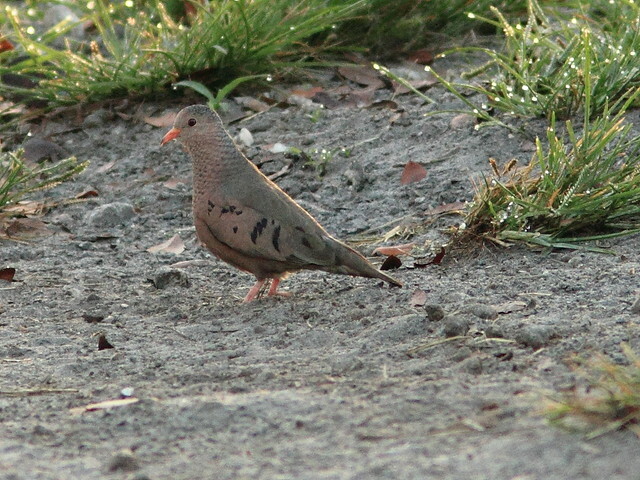 The Common Ground-Doves are cooing love songs. 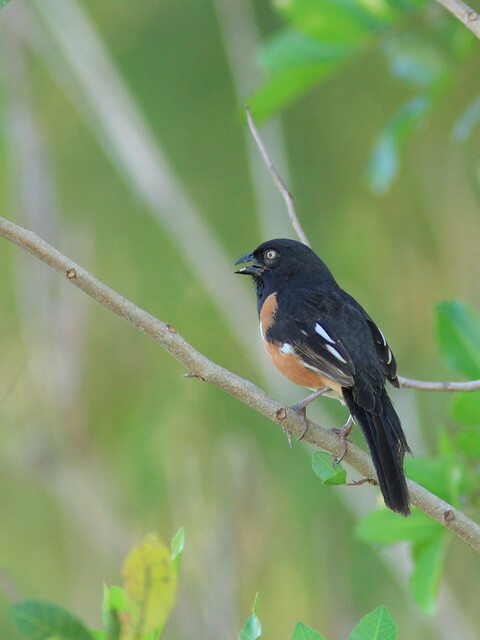 Eastern Towhees are singing on territory. 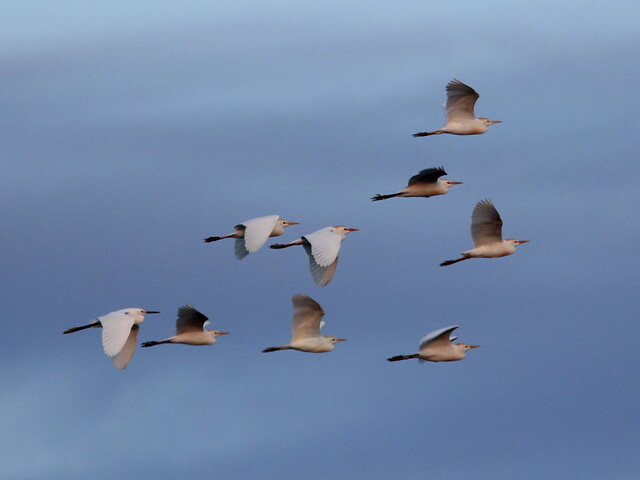 Their whitish eyes identify them as local birds. 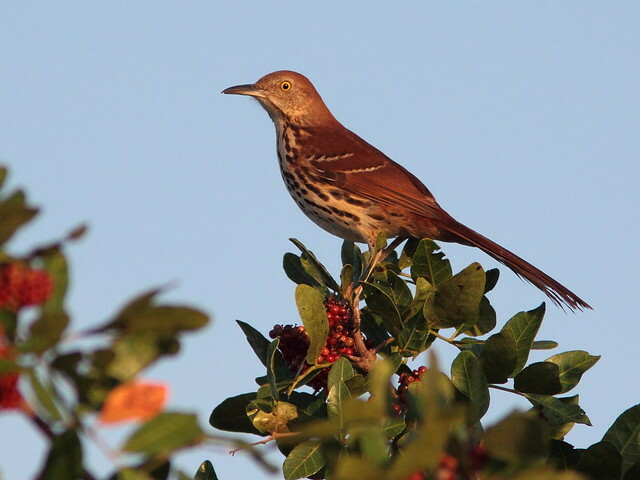 In early April it was not unusual to see a half dozen Brown Thrashers along the paths. 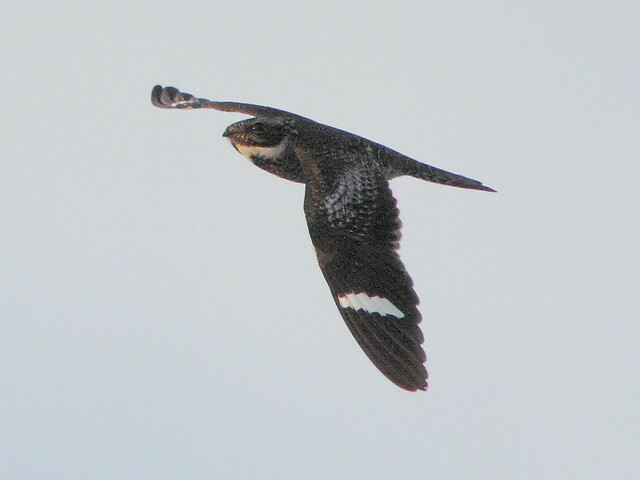 Most are passing through, but a few will nest locally. 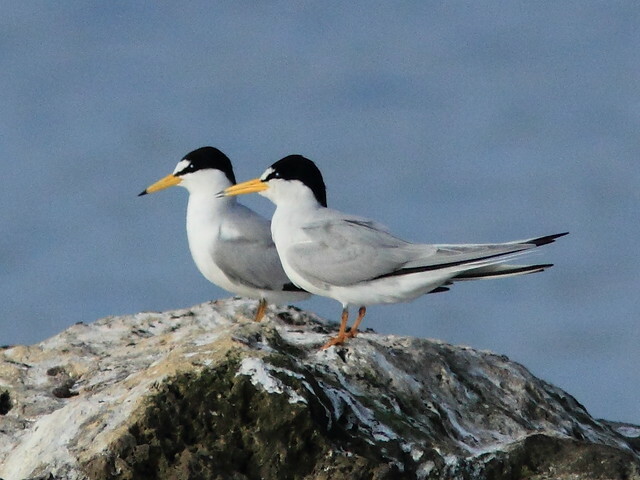 Least Terns have arrived at the lake. 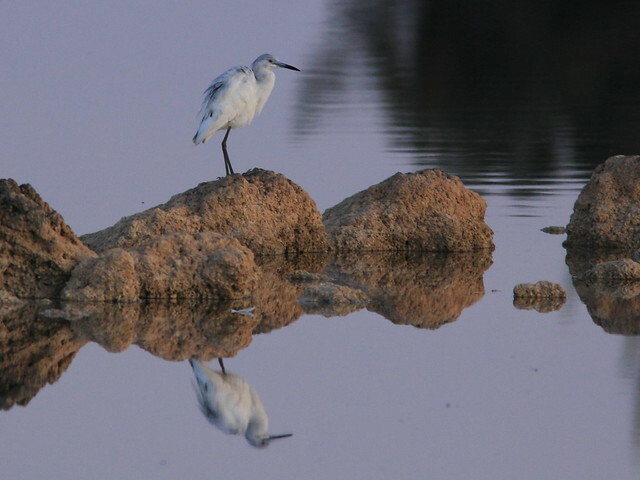 Soon the males will be offering little fish to their mates. They probably will nest on the flat roof of a nearby elementary school as well as that of a shopping center. 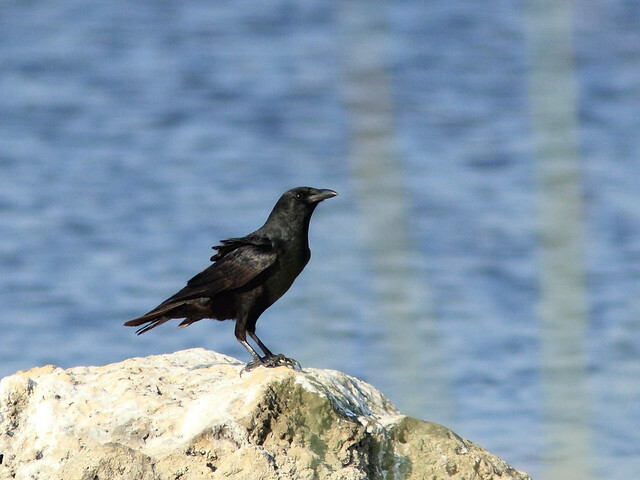 A Fish Crow unceremoniously displaced them from their perch on the rock, but they returned to dive-bomb the crow and chase him off. My reflexes were too slow to catch the action. The water levels are dropping in the wetland next to our South Florida subdivision. 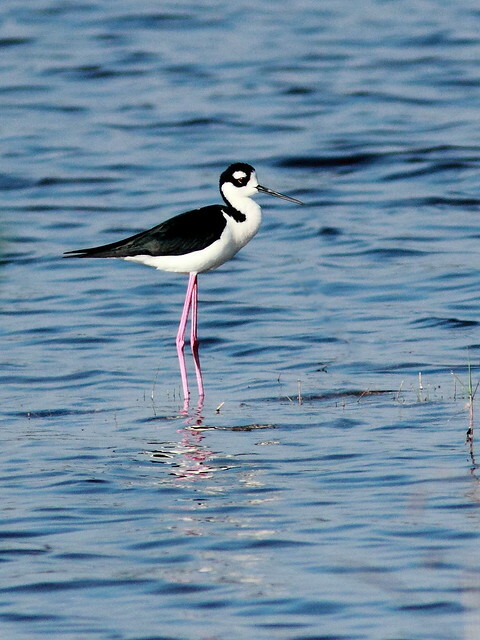 This concentrates prey and attracts long-legged waders. 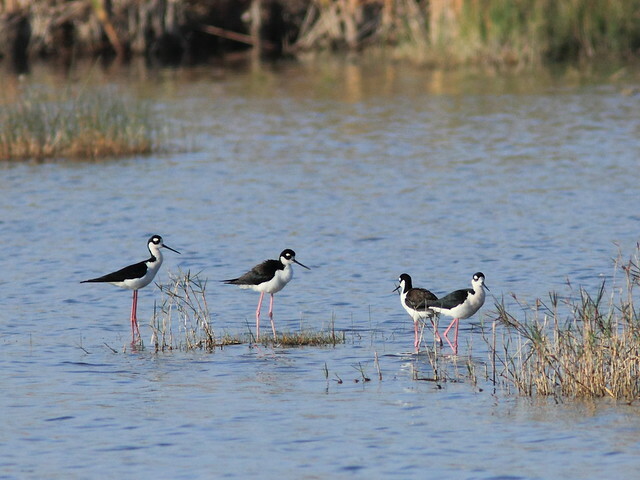 This week we had our first Black-necked Stilts, a flock of four birds. 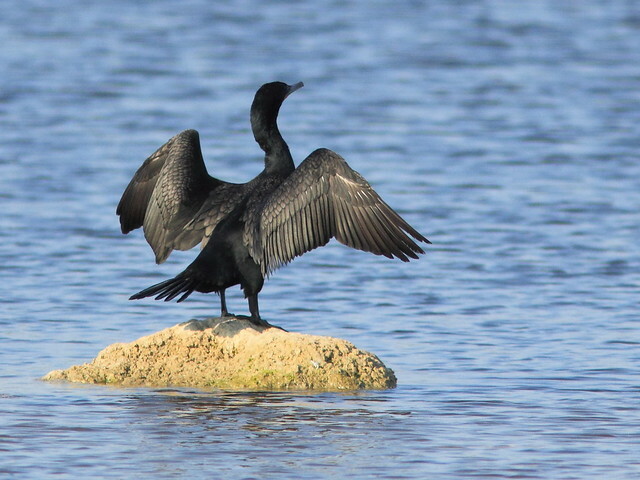 A Double-crested Cormorant dries its wings. 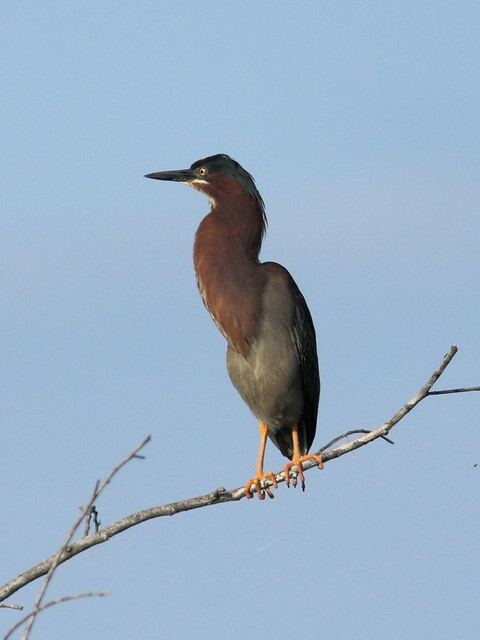 The lake margin provides a nesting tree for a pair of Green Herons. Expert contortionists, they assume many different sizes and shapes. 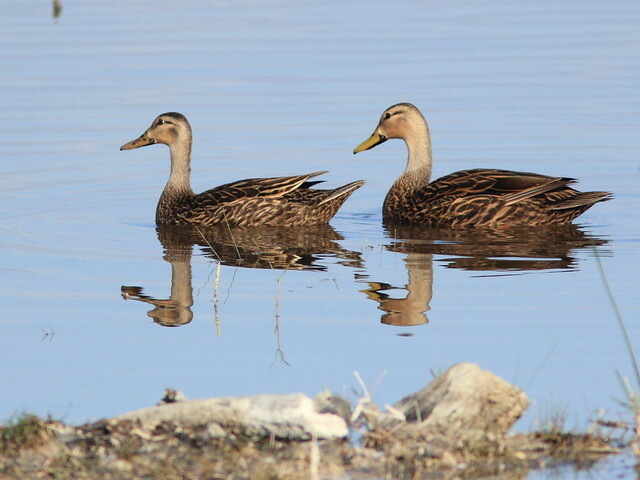 During breeding season, the female’s yellow legs distinguish her from the male, which has orange legs. 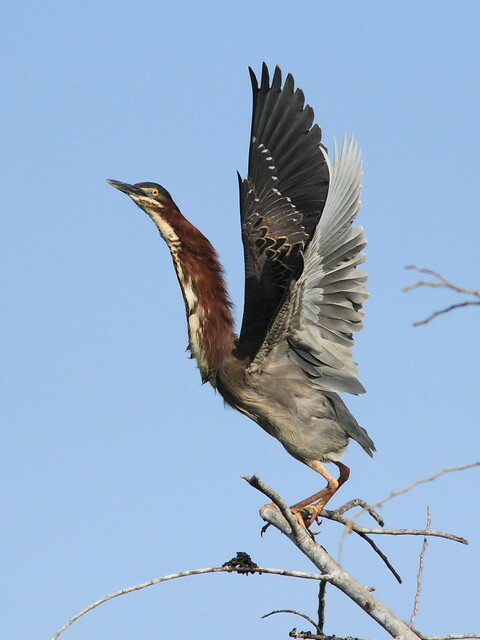 The female ruffled her feathers as the male flew in, perhaps a recognition signal. As the male took flight he provided me with an image of intricate feather patterns (click on the photo and view it in large size to study the plumage detail). 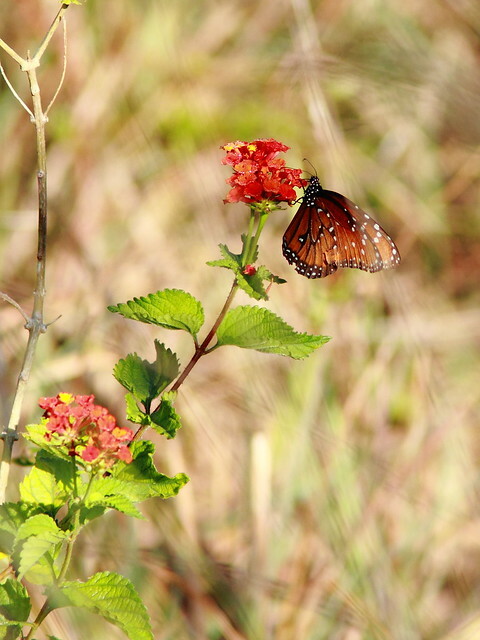 Before our guests arrived, I visited Plantation Preserve with the Tropical Audubon Society. 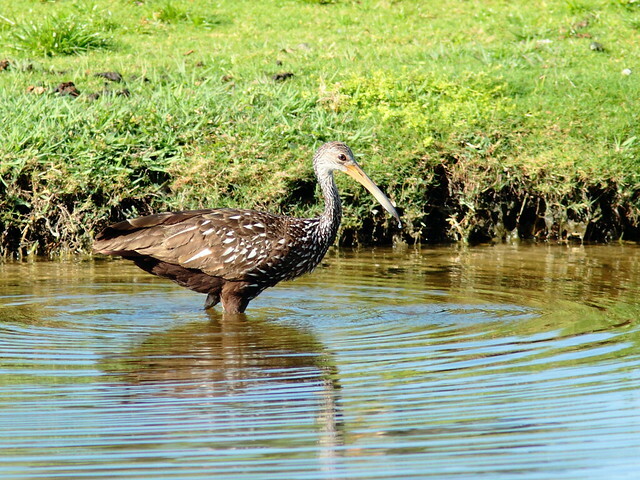 There we saw this Limpkin. 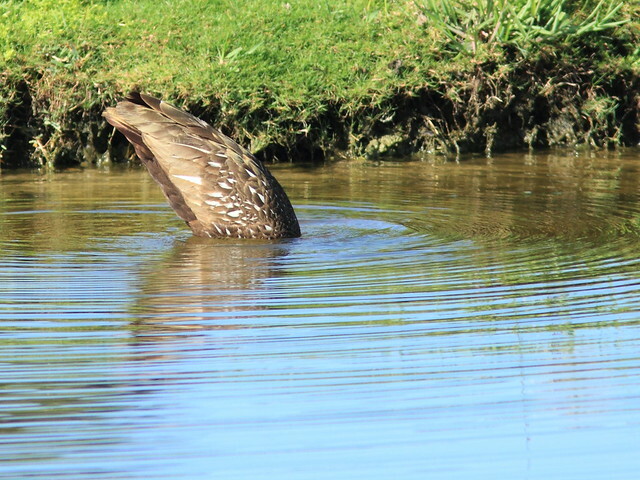 Rather unusual, at least for me, was to witness the Limpkin’s habit of dunking into the water like a puddle duck. 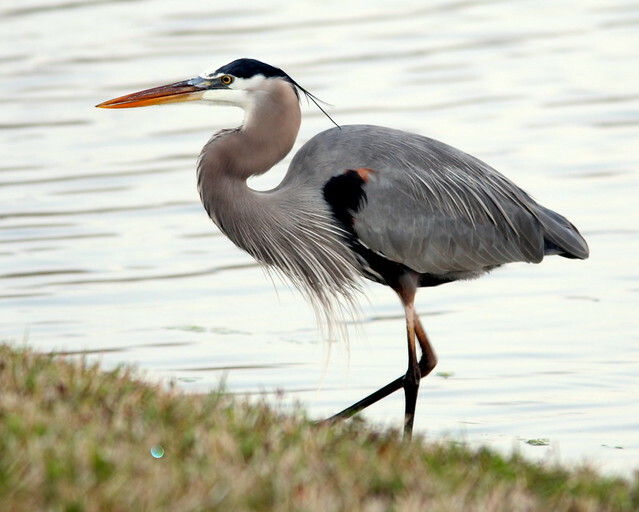 Great Blue Herons can look and sound like pterosaurs from Jurassic Park. Because they are common and approachable, they are favored photographic subjects. 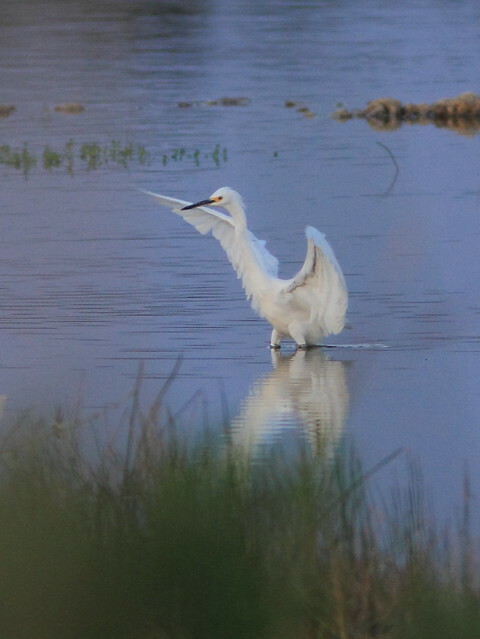 Depicted in every imaginable pose, flying, standing, wading, hunched down, stretched out, roosting, nesting… I had to think twice about putting more photos of them on these pages. This one visited our lawn. 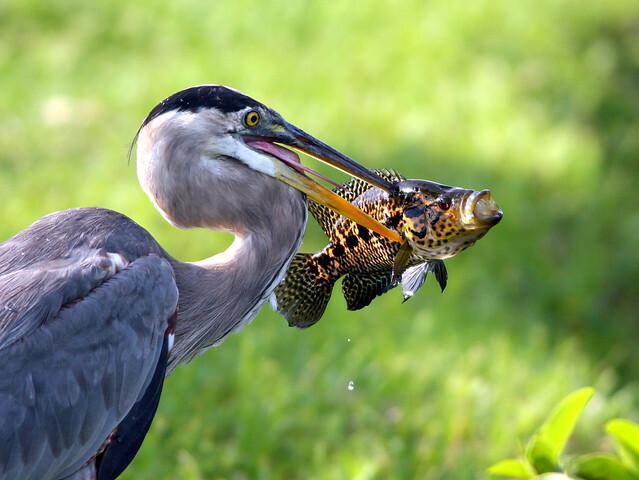 We saw another Great Blue Heron catch an exotic Plecostomus species in our back yard. I took the closeups through our back patio window. It flew across the lake and had it half-swallowed in a little more than five minutes. 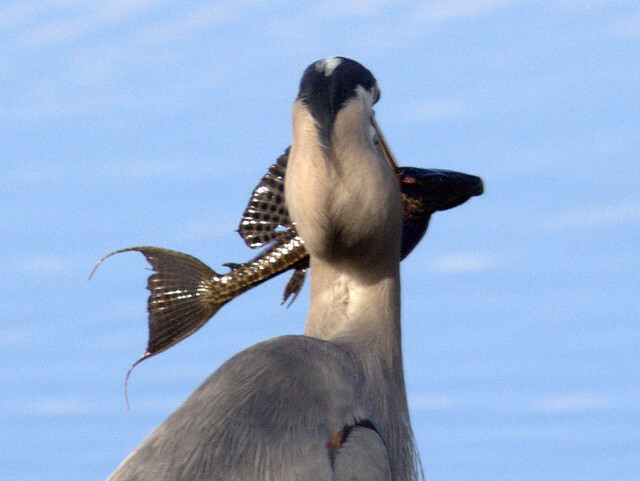 I was surprised how quickly the fish went down despite its poisonous spines. 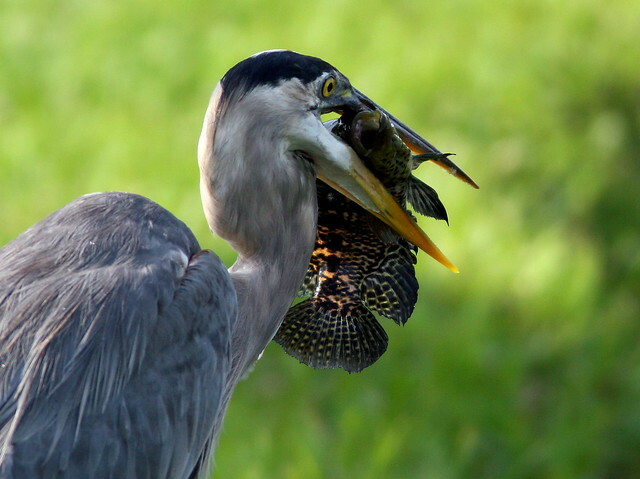 My all-time favorite is this image of a Great Blue that caught another exotic fish (a Jaguar Guapote, native to Nicaragua), this time at Shark Valley in Everglades National Park. Q. 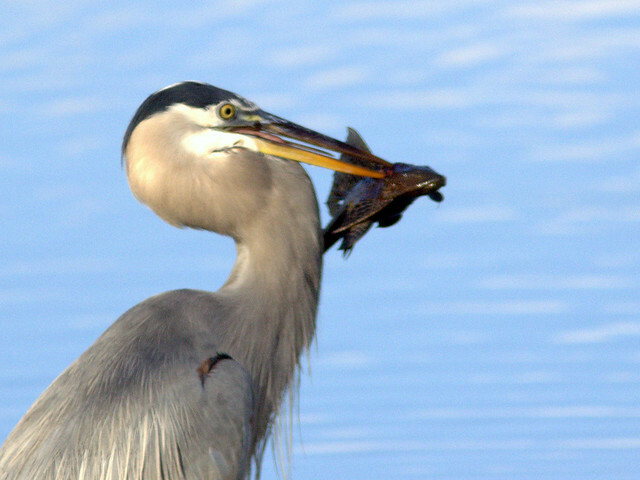 Is a great blue heron a reptile? Re: identify this prehistoric bird? 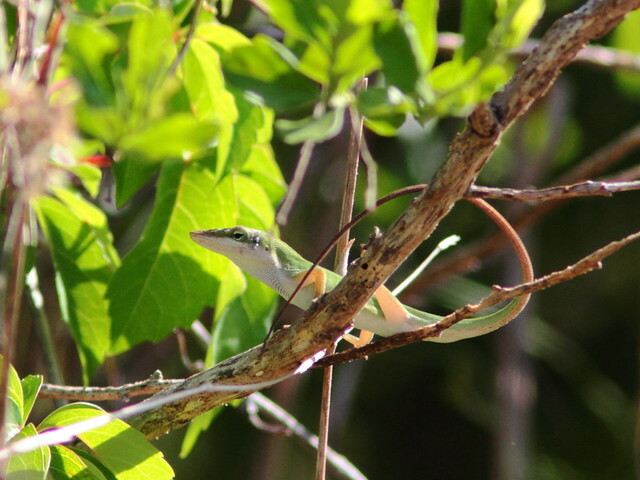 … and all of a sudden, this “thing” looking like a prehistoric pterodactyl made very loud wild noise as it flew down from a treetop straight at me! 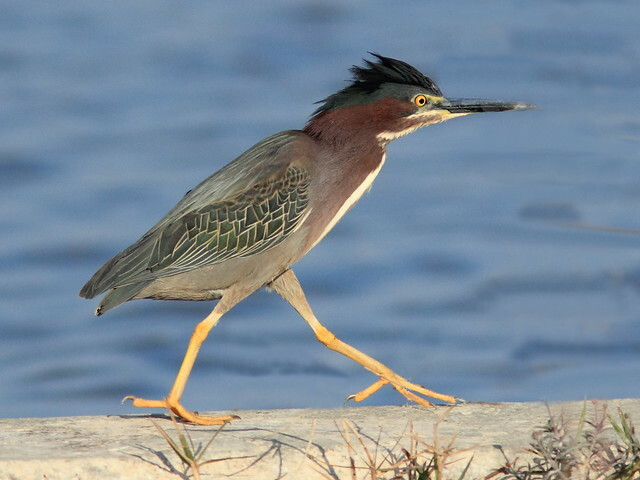 Indeed, there is fossil evidence that herons have been around at least since the Miocene epoch. A 14 million year old specimen was recovered in the Observation Quarry in Nebraska, and Great Blue Heron fossils found in the Western Hemisphere date back 1.8 million years, to the Pleistocene epoch, about the same time when the first human fossils were discovered. 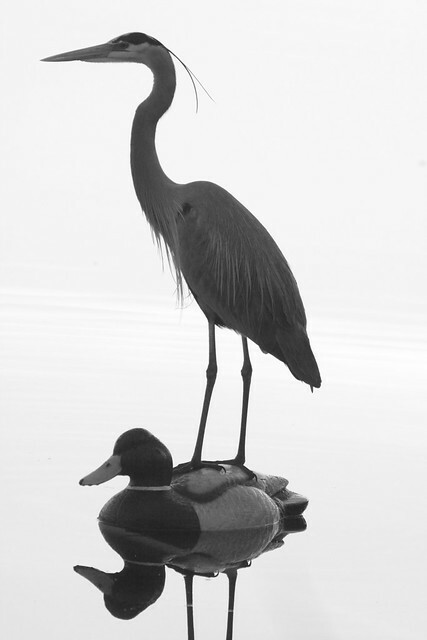 (Reference: The Great Blue Heron, by Robert Butler, UBC Press, Jul 1, 1997). 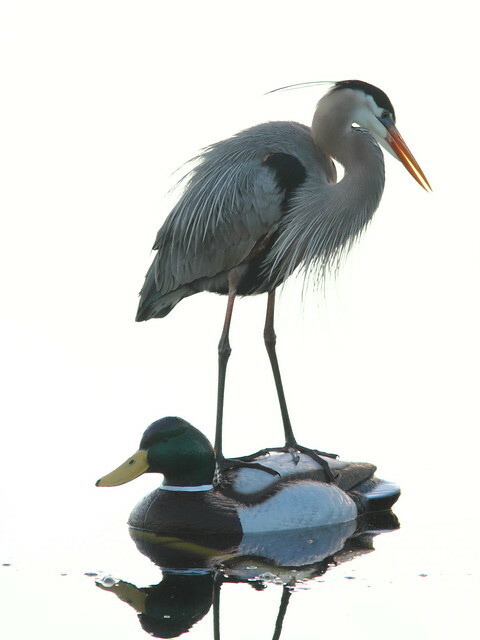 Recently, I posted an image of a Great Blue Heron that suddenly decided to use the new duck decoy that floats the intake of our sprinkler system as a convenient fishing platform. Well, it’s baaaaaack! There it was, in the pre-dawn semi-darkness, just outside our back patio door. I took several hand-held photos through the window, not expecting any to turn out very well. I was right! The images were soft and badly back-lighted. 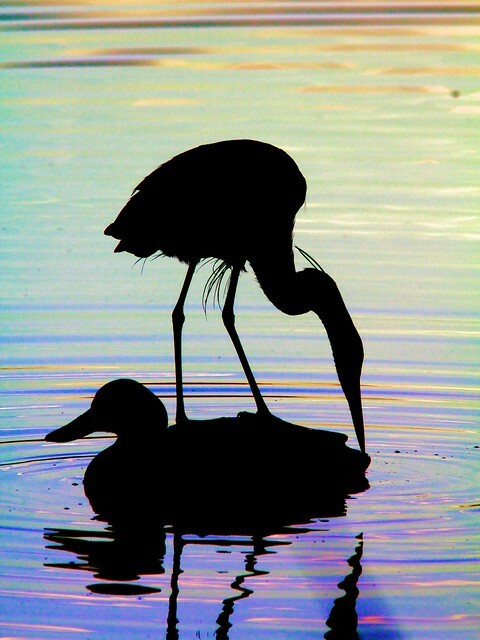 I stepped up the contrast and saturation and the bird was silhouetted against a background of living color. 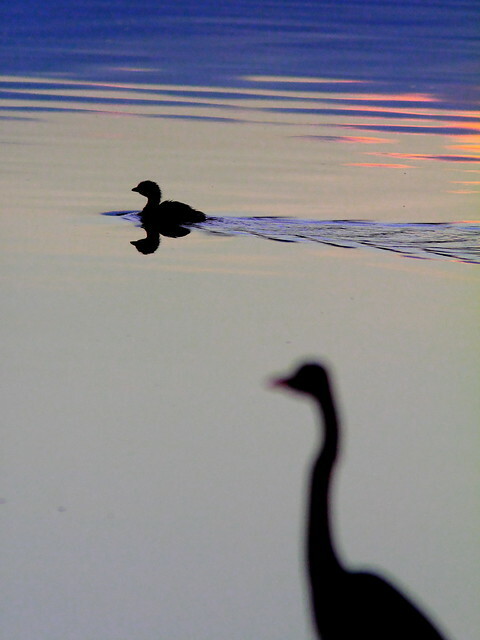 The bird was so near that it did not fit into the frame unless it lowered its head. I had to back up when it extended its neck. Conveniently, a Pied-billed Grebe swam by, disturbing the still water. 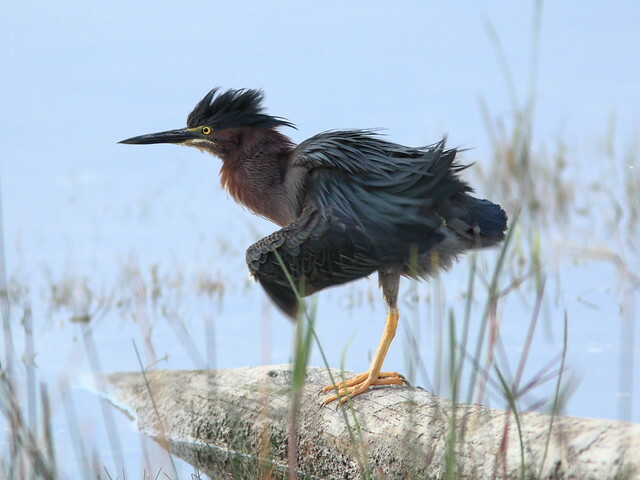 Good news: By late March our local heron rookery contained a total of seven nesting pairs of Yellow-crowned Night-Herons, plus three immature birds and possibly a 15th unattached male. 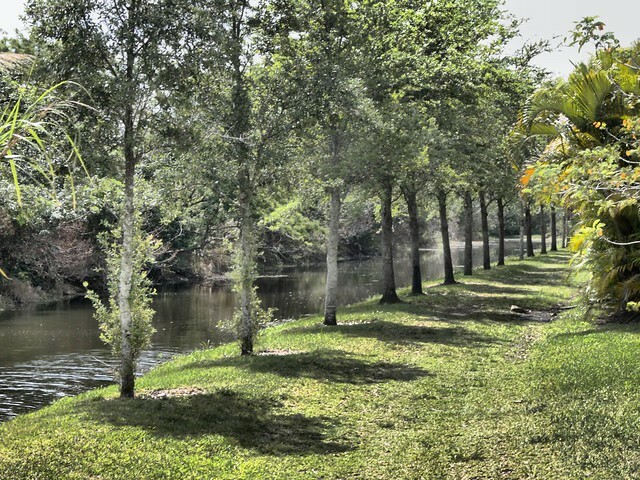 The rookery runs along the edge of this canal, on the opposite side of a power substation with these landscaped grounds. Across the canal, note the defoliated trees next to the water that were treated with herbicide. Last year the nests were well hidden, but now several are out over the water on dead and dying limbs. 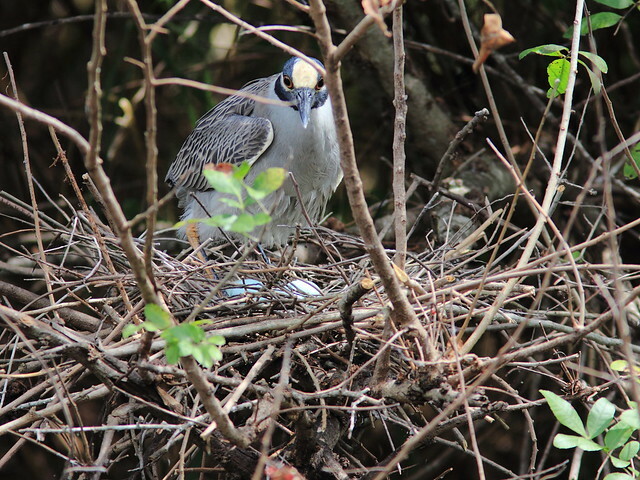 This Yellow-crowned Night-Heron is tending its blue eggs in a nest in one of the herbicide-treated trees. 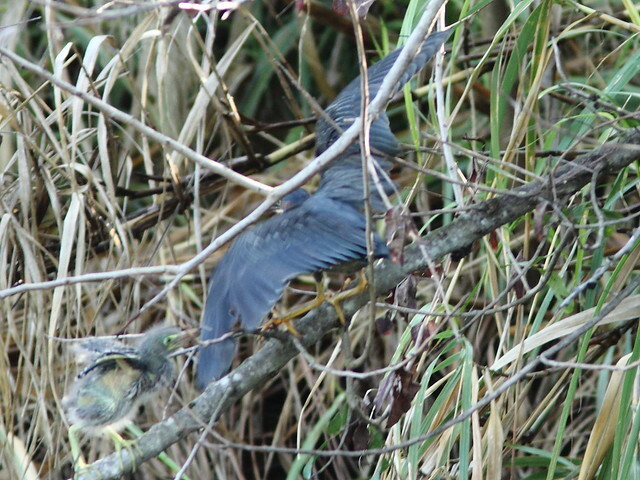 Additionally, I found two pairs of Green Herons. One pair has eggs in its nest. 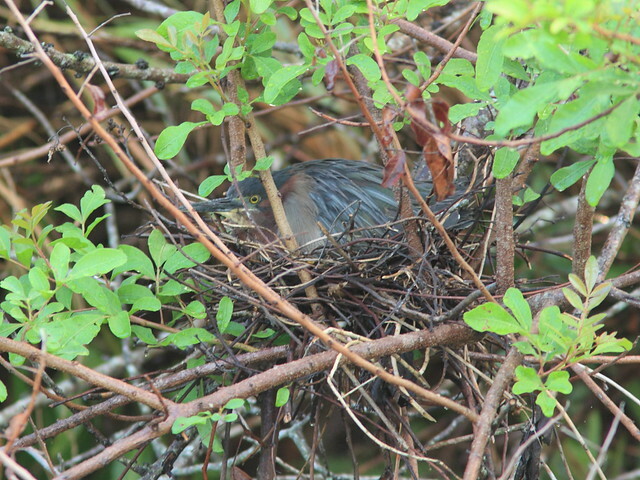 I could not find the second Green Heron nest, but suspected it was hidden in dense vegetation along the canal, near the south end of the rookery. Here, the pair exchanges incubating duties. Bad news: On the morning of March 23 Mary Lou and I made a routine visit to the local Bald Eagle nest to check on the welfare of the single eaglet. 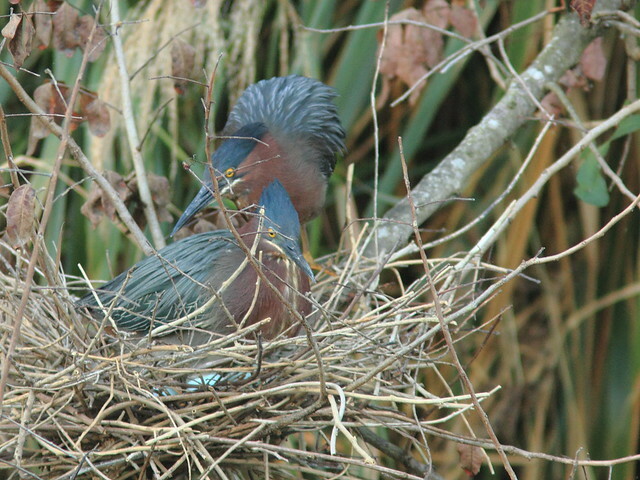 We had watched it being fed by its parents two days earlier, and the evening before it was seen on the nest. The nest was now empty. We were concerned that the eaglet was not ready for free flight. Although it had been 68 days since ground observers deducted from a change in the adults’ behavior that the first egg had hatched, this chick was lagging about week behind an important milestone. Over the past three years that we and other volunteers have been monitoring the nest, the oldest eaglet started climbing out on branches and “helicoptering’ (hovering in place a few inches above the nest) when they averaged 67.3 days old, and they took their first flight when they averaged 75.3 days old. The interval between first observed branching/hovering and first flight was eight days for each of the first-hatched eaglets. View this chart that summarizes key events recorded by ground observers over the past four years. 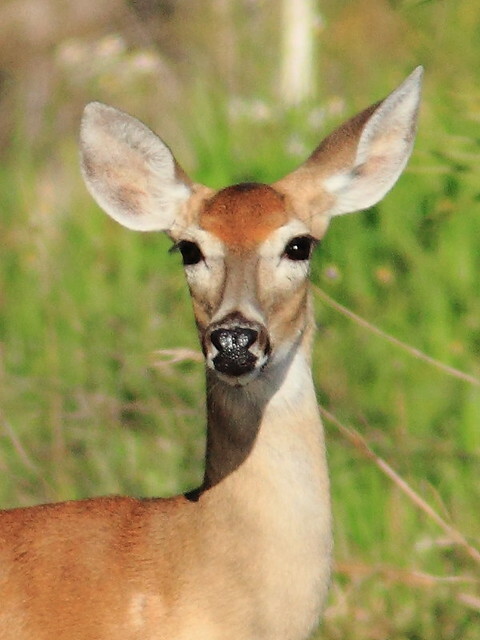 This adult was photographed in happier times. 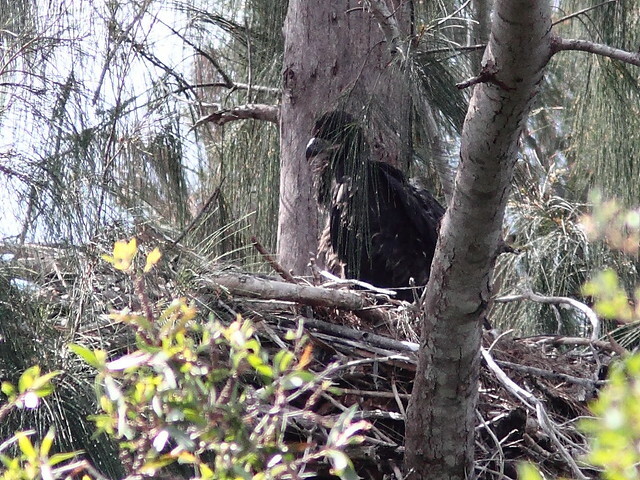 These were my last photos of the eaglet as it was being fed, taken on March 20. 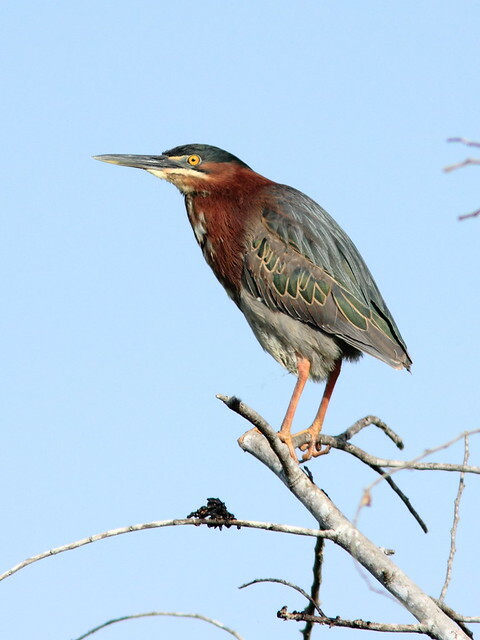 This is the lone Green Heron. Note the proximity of the homes that line that side of the canal. It is likely that the only reason the nest trees were allowed to grow was because they shield their residences from a view of the power substation. 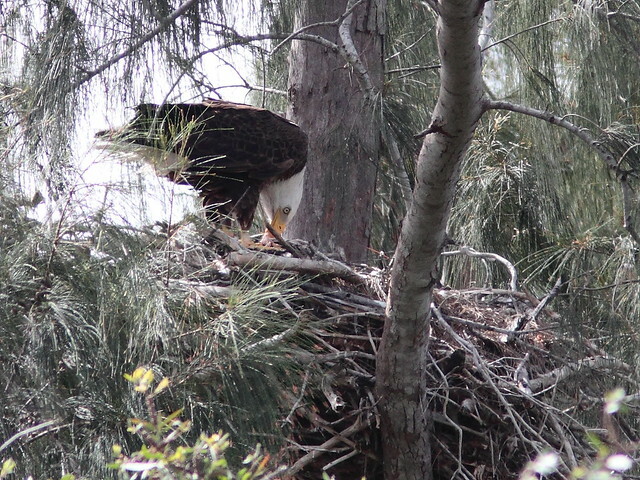 In the meantime, the eagle nest stood empty for almost a week, with neither the eaglet nor the adults in sight. This is most unusual. In all the other three seasons at least one adult kept watch over the newly fledged eaglets, at or near the nest site. They would bring food to the nest, in an apparent effort to entice the youngster to return. We usually could hear the calls of a downed eaglet. Although some eaglets went missing for a day or two, they always managed to find their way back to the nest, probably driven by hunger. 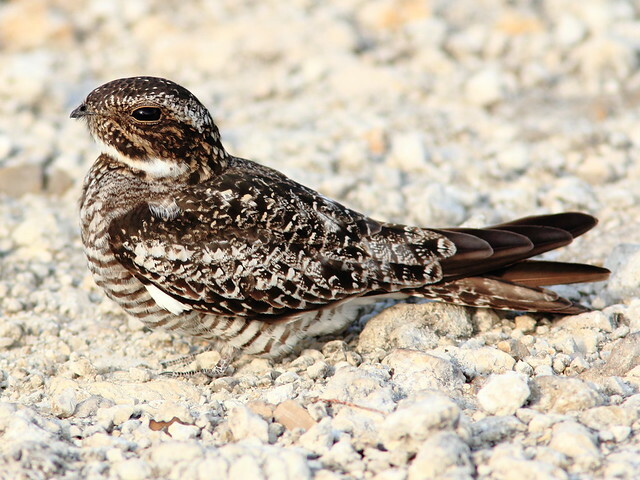 During the past three seasons the fledglings continued to return to the nest until they were about 4 months old, to be fed, rest, and sometimes even spend the night . This time we heard no calling, and saw no evidence of parental concern. 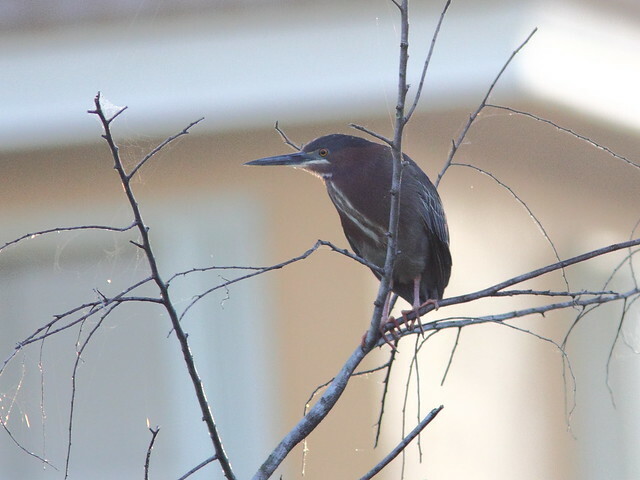 Good news: On March 27, when the Green Heron was pronounced ready for release, I met Steve near the spot where he had found it. 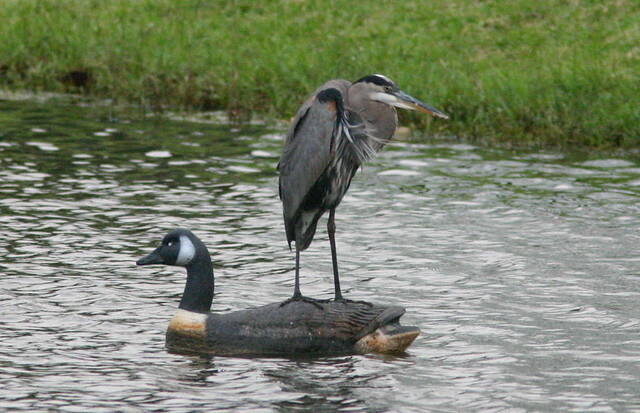 Steve carried it in a “pet taxi.” Steve opened the door and the heron flew out so fast that I could not get a photo. 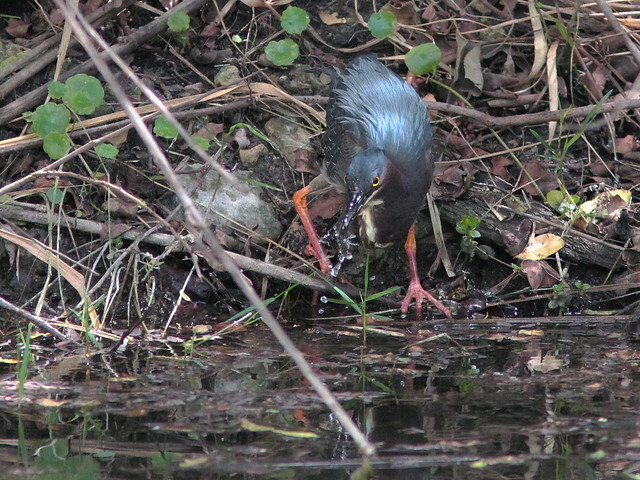 The little heron flew across the canal and immediately began drinking water. 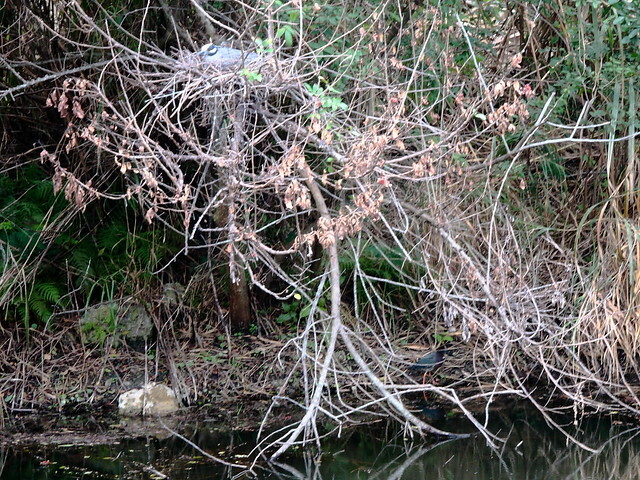 It then rested along the bank just under one of the Yellow-crowned Night-Heron nests in a herbicide-treated tree (Look closely– the Green Heron is at the lower right and the Yellow-crowns are at the nest in the upper left of this photo). I watched the released heron for about a half hour, hoping to see it reunited with its mate, but it never moved very far south from where it was released. 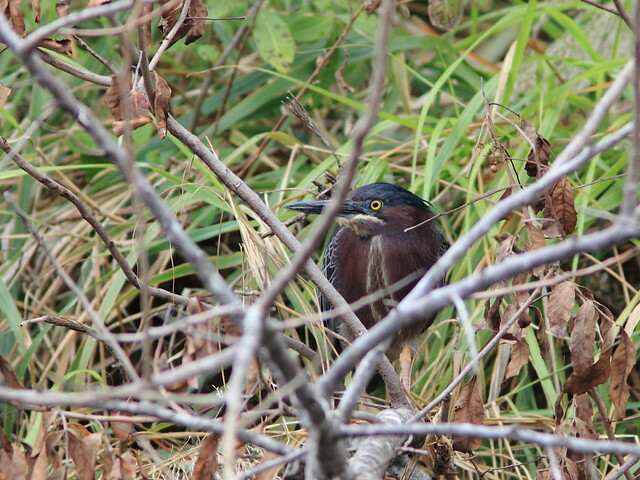 I found and photographed a single Green Heron in a thick patch of brush along the canal where a pair nested last year, but I could not see a nest. Even more bad news: By March 30, the eaglet had still not been seen or heard, and no adults were observed in the vicinity of the nest. I called the Florida Fish & Wildlife Conservation Commission (FWC) hotline to report our concerns. 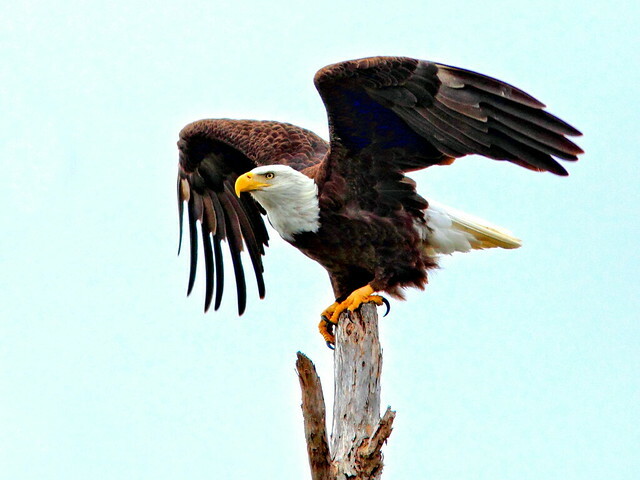 Since it was not considered an emergency, they put me in contact with Michelle Van Deventer, FWC Bald Eagle Coordinator. After concluding that the eaglet very likely had not survived, Michelle authorized me to investigate under the nest. Her instructions were that if we discovered any eagle remains, we were not to touch them and to call FWC, as a forensic examination would need to be conducted to determine the cause of death. 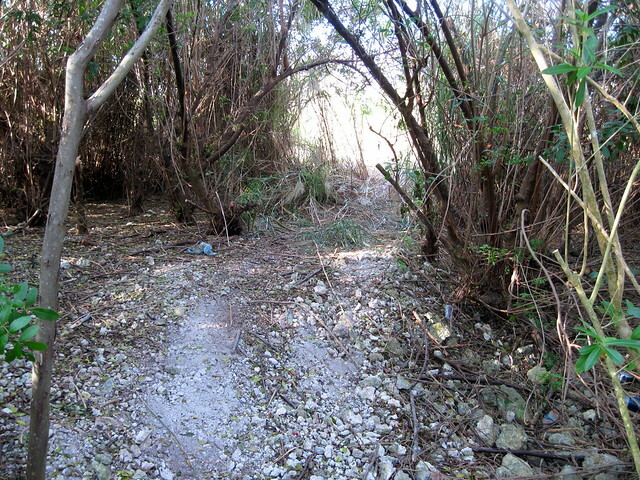 I had earlier obtained permission from the City of Pembroke Pines, owner of the land, to enter the nest area, and notified the head of Public Works of my intention to walk out to the nest. Fellow volunteer eagle watcher Al Griffin and I arrived in the area of the nest before 8:00 AM that morning. As has been the case, neither adult nor young Bald Eagles were seen or heard. Al had already set up two ladders which provided a way to get over the fence directly in front of the nest tree. 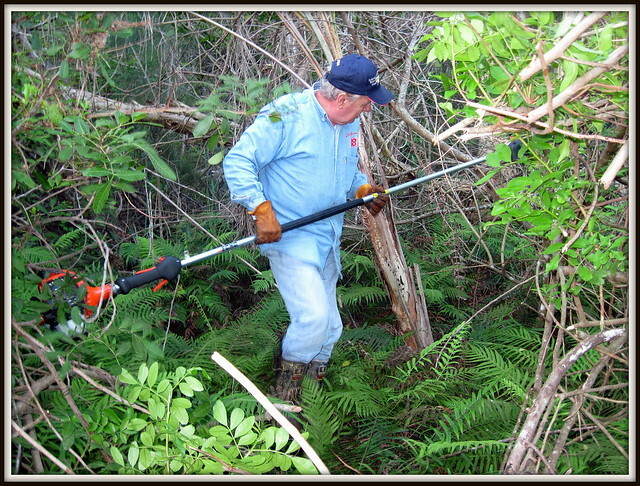 He also had a small chain saw which allowed us to get through the tangle of Melaleuca saplings, Brazilian Pepper shrubs and vines that are especially thick at the edge of the wooded property. Al, who serves with me on the Mayor’s Bald Eagle Sanctuary Steering Committee, is a retired firefighter and is always prepared. He had parked his pickup truck off the roadway in an no-parking area, but put up traffic cones and even one of those small traffic control horses. We had to hack our way about 20 yards before entering a more open area populated by larger Melaleucas and Sawgrass. There were areas of standing water and mud. 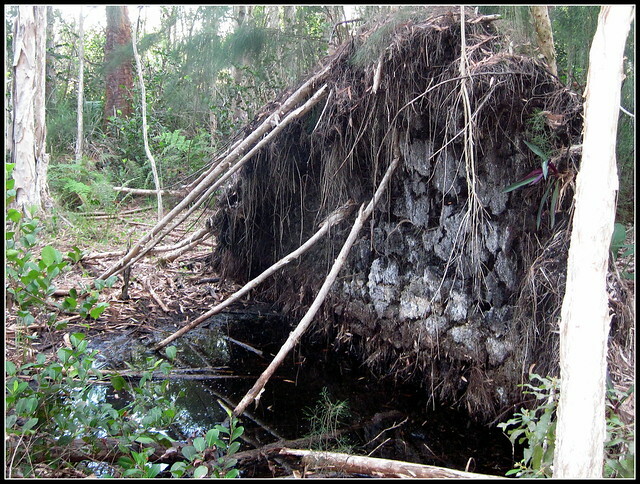 These are the roots of a large Australian Pine that was toppled during Hurricane Wilma. Since the eagle nest is in the same species of tree, it is vulnerable to being uprooted in a wind storm. The area immediately around the nest tree was somewhat clearer. 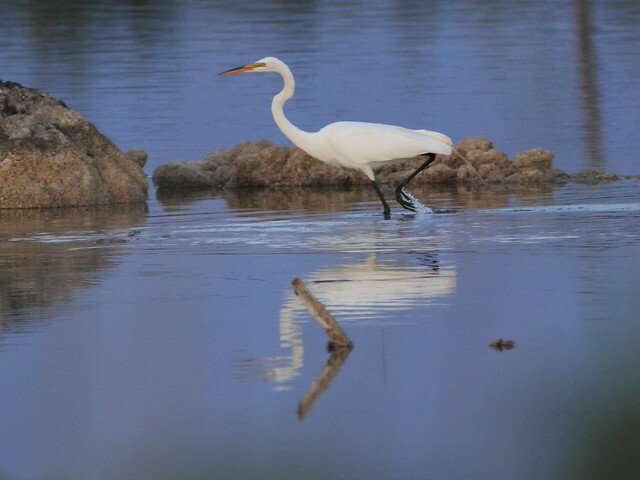 We carefully searched a circular area about 50 feet around the nest, and found many prey remains– feathers of white and black and white birds, probably adult and immature White Ibis, and possibly egrets. We found no bones, but they likely were carried off by scavengers such as rats, mice, Opossums, Raccoons, Gray Foxes and Bobcats. A few feathers were white with brightly iridescent black areas that may have come from a Wood Stork or possibly a Muscovy Duck. However, there was no evidence of a dead eaglet. Of course, it too may have been scavenged. Nearly all the contour feather we found were white, and they were more concentrated to the west of the nest tree, not surprising in view of the prevalent easterly winds. 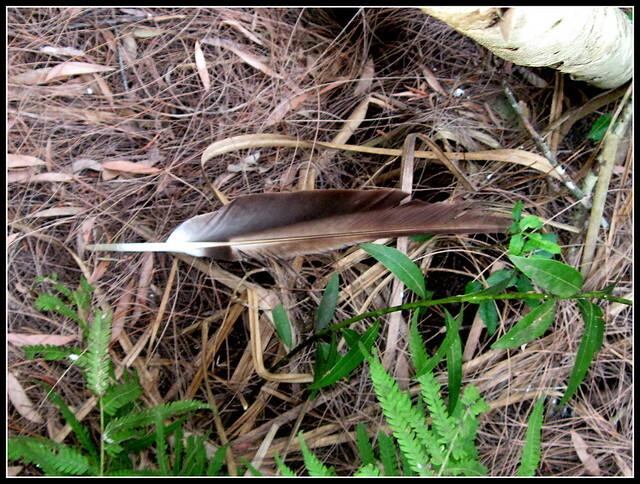 Only this 17 inch quill appeared to have belonged to an eagle. It showed signs of wear and bleaching and probably had recently been molted by one of the adults. I informed the FWC agent and was told they would not retrieve it unless we found a dead eagle or received a complaint the the eagle had been disturbed or killed. I moved it to a more protected spot in the event that an official of one of the American Indian tribes wanted to retrieve it. 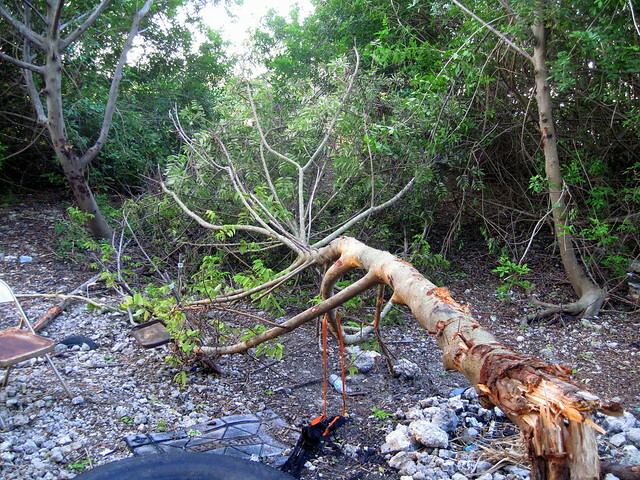 Although we had cleared our activity with the City, we forgot to notify the police! After about two hours of searching the nest area, three police patrol cars showed up, lights flashing. The officers were cool and interested in what we were doing, as the eagle watchers are a common fixture along the roadway in front of the nest. 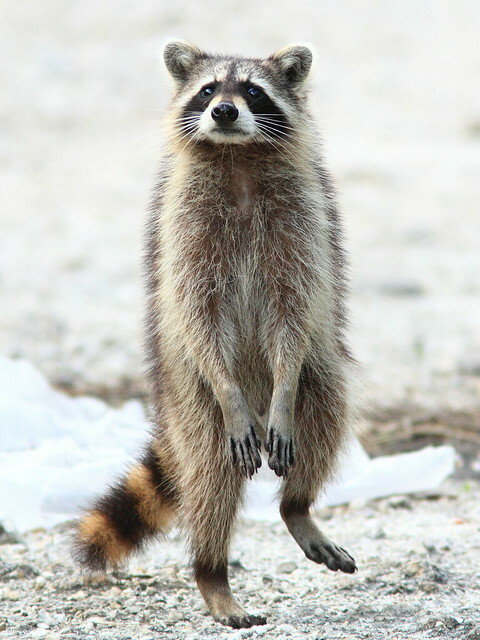 An alert bicyclist passing by the nest had called them after seeing our vacant vehicles and hearing us in the woods. Al and Trisha, another member of the Mayor’s Committee, handled the cops while I worked my way to the southwest, generally following a line along which the prevailing winds had blown more feathers. This brought me into the heart of the stand of herbicide-killed Melaleuca trunks where the eagles often roost. It also provided a panoramic view of the west side of the “eagle forest.” I scanned the treetops for signs of the eaglet, as we did a couple of years ago when one went missing and we found it “tree-hopping” back to the nest. No such luck this time, and likewise the areas around the larger and favored roost trees were clear. 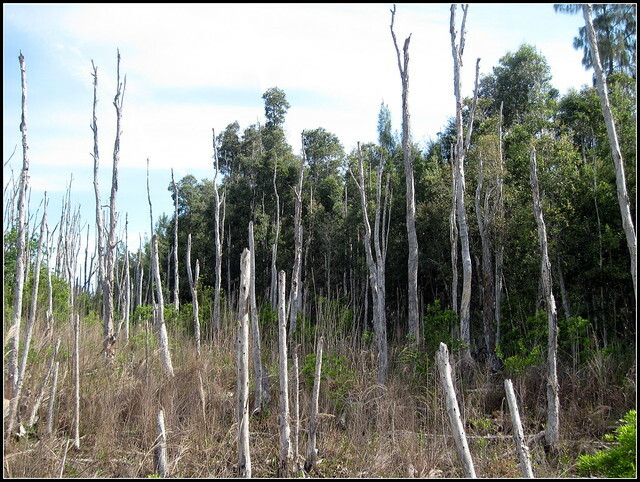 The “Melaleuca Graveyard.” Occupying a tract that is owned by the South Florida Water Management District, these trees were killed by herbicide several years ago in order to improve the habitat for native Everglades vegetation. The wooded area that includes the eagle nest is to the right.